My last post on the Banksy/Colossal Media hit drew some interesting responses and I feel I need to clarify a few things. For one, I am in no way supportive of a Street Art in which artists pay for their work to be put up by someone else. This takes the entire artistic act and renders it politically impotent. By breaking the law and taking your vision of the public environment into your own hands you are directly challenging the way our public space is used. Every Graffiti Artist and Street Artist understands this as a part of their process and one of the materials they use to create their work. Often the removal of the artwork, like the putting up of the artwork, is the most interesting part of its life. It is at these points that the piece exerts its message the loudest, demanding the recognition of a system which supports a singular commercial vision of the city over a publicly negotiated environment. If then the Banksy mural is not true Street Art, but some botched attempt by a once street artist, is there a way to create artwork out of this failed attempt? The answer is yes. By failing to properly permit the sign, the landlord and Colossal Media unknowingly committed the same crime Street Artists and Graffiti artists commit at will. This failure to obtain a permit requires that this mural be taken down just like every piece of Street Art is removed. The mural may not have had the potency Street Art has when it went up, but I would argue it can have that same potency when it comes down. This work, unlike other Street Art or Graffiti pieces has been publicly acknowledged and supported up to this point. Sadly, this puts it into a more interesting place politically than most other Street Art because people all know about it and like it. If the removal of this mural was to happen before the illegal billboards in the surrounding area and it was made public, an important public space issue would become crystal clear. Obviously the city cares more about the advertising companies than the wishes of the public and thus the city itself. 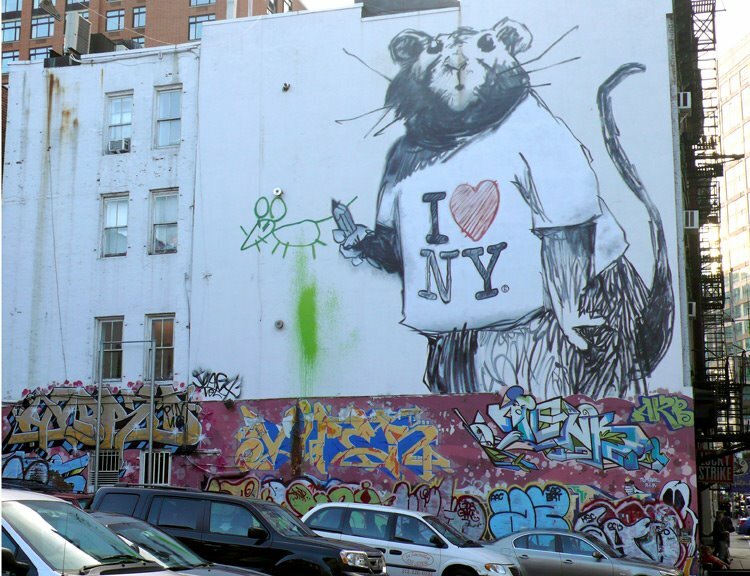 Good Street Art brings public space issues to the forefront of people minds. 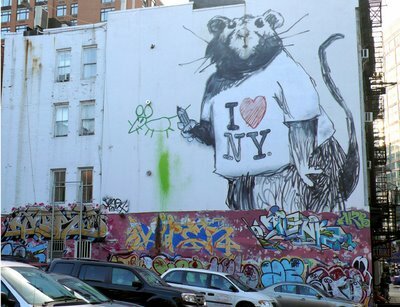 Maybe the mural will be a true piece of Street Art when we as a public take the creation of the artwork into our own hands and use the materials Banksy has given us to make art, whether he intended to do so or not.